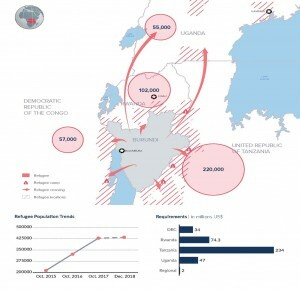 According to the UN, over 55,000 Burundians found refuge in Uganda, north of Rwanda. More than half of them are children. 90% of all Burundi school-aged children are unable to receive schooling. In 2018, we conducted our own Uganda fact-finding mission. We now want to extend our success in Rwanda to Burundi refugees in Uganda. 100,000 people from 10+ nations live in Nakivale Refugee Camp where there is only 1 UN-run elementary school and 1 UN-supported secondary school. Students attending these 2 schools speak many different languages so the task of educating them is even more daunting. Consequently, most school-aged children go without schooling. Often community leaders in the camps teach students in informal classrooms held under the shade of a tree or in tents. We have decided to support Burundi students in Ugandan refugee camps as well as in the cities. In the capital of Kampala, as well as various other cities throughout this small country, we support students attending both public and private schools. This support includes tuition & fees, supplemental food support to families, and micro-loans to parents so they can create a way to provide for themselves. We’ve found that secondary school students attain better results while attending boarding schools because there they escape the trauma of food insecurity, cramped quarters, and the the various stresses that derive from inadequate living conditions. We have 374 students registered to enroll in the 2019 school year.